Welcome to the Ink it! Stamp it! Design Team Blog Hop - we hop every month so be sure to pop back and visit us again! Today our theme is 3D projects - something I find quite challenging! 3D is not my natural habitat so I sought help and found it in Kirsteen Gill's blog. She has very generously provided a tutorial for elongating the Window Box which is currently the most underused item in my craft room. Following her instructions, I used one 12" sheet of Basic Black cardstock and 8" x 1.75" strips of Petal Passion Designer Series Paper. I made a little tag by elongating the smallest of the Lots of Labels dies and scored it in the middle. 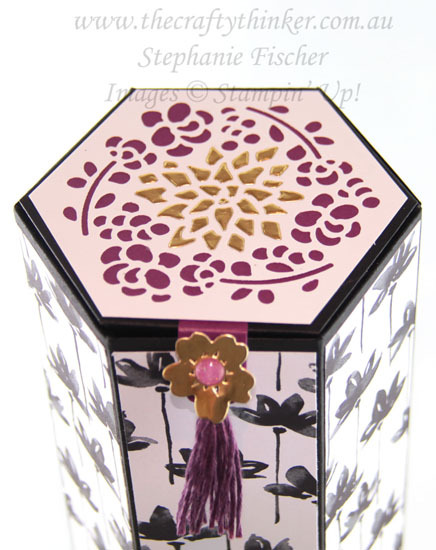 Half is adhered to the top of the box and the other half supports a tassel and a little gold flower. The decoration for the top of the box is cut in Whisper White and I've added a layer of Rich Razzleberry underneath it. Using a little scrap of leftover Gold Foil Sheet (with Multipurpose Adhesive Sheet attached) I paper-pieced the flower in the centre of the top. Although there are flowers all over this box, I think that the colour scheme keeps the project gender neutral. Thank you so much for joining us today. We hope you'll join us again next month for our Technique-based Projects! I'm Stephanie Fischer and to keep hopping arouond, see the list below to see who is up next with another great project!